I put this recipe for Chicken fricassée in family favourites mainly because it is just that. We love it and the boys love it too and it is even served at my son’s school! Now traditionally fricassée is a French method of cooking, where the meat is cut into pieces and sautéed but not browned and then cooked in a white sauce. according to Larousse Gastronomique (if you don’t have a copy then well worth the investent as this IS the BIBLE of cooking) all sorts of meats were used and this was in fact popular in 17th century France. I’m not sure of the authenticity of my version, but this is very popular in Germany and this is the way I like to cook it. I usually go easy on the capers as my kids don’t like it too sour so I sprinkle a few over the top on mine and I’m sure other ecipes don’t even call for capers as this could be a German thing as they like many dishes to have a sour note! My Father in law often cooks up and it is really good, although he always used canned mushrooms or mushrooms out of a jar. He also uses white asparagus out of a jar too, which I must admit does give it a certain flavour which I accept, however, I find the mushrooms disgusting. Nowadays he always uses fresh or at least when he knows I am around he does. 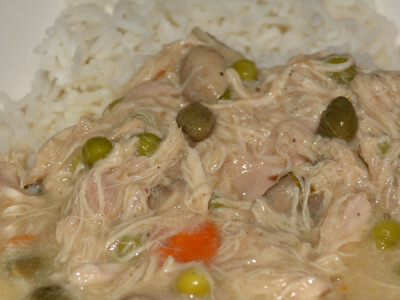 This version of chicken fricassée may seem a bit time consuming to cook, mainly due to the preparation involved. You could use leftover chicken or buy a ready cooked chicken or even chicken breasts cut into bite sized morsels but I find that boiling the chicken until cooked also creates the stock needed. Put 1.5 litres of boiling water into a large pot and season with salt. Place the chicken into the pot and bring to the boil skimming of any foam. Stick a clove into the onion an add this with the vegetables and the bay leaf into the pot with the chicken and reduce to a simmer until the bird is cooked. This will probably be about an hour and a half, but you can check by pearcing the chicken in the fattest part to see if blood comes out. When the chicken is cooked remove it from the pot and place to the side. Strain the liquid through a seive into another pot then reserve 500ml. Reserve the carrot and dice and put to one side. Remove the skin from the chicken, then remove the breast meat and legs. Remove any bones and cut the meat into large pieces. Melt the butter in a smaller pot and add the flour and stir continuously until the butter and flour mix is golden. Slowly whisk in the 500ml of stock making sure there are no lumps. Bring the sauce to a boil then simmer for about 5 minutes. Add the asparagus, mushrooms and chicken to the sauce and keep simmering for about 10 minutes, then add the white wine, lemon juice and sugar. Now add the diced carrot. Beat the eggs with the cream, turn off the heat and slowly stir in thickening the sauce. Season with salt, freshly ground black pepper and worcestershire sauce and the capers. Serve with some plain boiled rice!